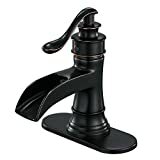 Deck to aerator distance 4-15"/16"
Delta Faucet produces kitchen and bathroom faucets for both domestic and commercial uses. 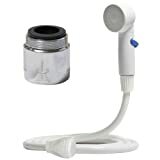 As part of the company’s vision, they have brought about a new version of bathroom faucets labeled Delta B3596LF Bathroom Faucets. The continued popularity of Delta’s products is the reason why we have brought you our Delta B3596LF Bathroom Faucets review. Imagine yourself having a bath in a royal décor. Does it not feel classy? Its oil-rubbed bronze texture gives it a simple and chic look. Moreover, Delta bathroom sink faucets have a water sense certification that proves the company’s commitment to promote less water consumption and enhance users’ experience using water in their day-to-day life. This feature makes the faucet eco-friendly and can reduce water wastage. 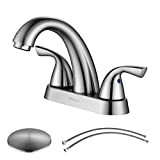 Delta B3596LF Bathroom Faucets review is intended to help you with your buying decision. It uncovers the benefits but also some drawbacks of the product. As a reviewer, we must demonstrate whether the support is up to the expectation level or not. For this purpose, Delta B3596LF Bathroom Faucets review will now make you acquainted with the key features of the product that captured our glance. Warranty service of Delta faucets comes in two different categories, (a) lifetime limited warranty on non-electronic parts and finishes (5 years for commercial purposes), and (b) 5 years warranty on electronic parts (1 year for commercial purposes). Only batteries are out of the warranty services. This particular faucet has been certified with water sense documentation for having the ability to reduce water wastage. This faucet can be considered to be eco-friendly as it cares about the nature and maintains the water leftovers at a minimal level without hampering the user experience. Besides being an eco-friendly faucet, it also can gratify you with its water flow. Water flow is measured by gpm, which means gallons per minute. According to the Federal standards, 2.50 gpm is the maximum limit a faucet can flow. On the other hand, as stated by U.S. Environmental Protection Agency (EPA) and American Society of Mechanical Engineers 1.50 and 0.25 is the maximum and minimum flow rate respectively. Delta Faucet has maintained 1.5 water flow rate, which is up to the standard of both organizations. Delta Faucet has four 5/8-inch long and six 13/16-inch high necks that prevent the water from spreading over the floor. It also has four 15/16-Inch distance from deck to aerator. ADA elaborates as Americans with Disabilities Act. This act promotes civil rights law that forbids discrimination especially in case of a disabled person. Meeting ADA standards indicate that the faucet is user-friendly to the minor groups too. Delta faucet comes with a simple but sleek look that let your bathroom or kitchen to have a royal appearance. You are almost done with our Delta B3596LF Bathroom Faucets review, and you are now informed of the perks and drawbacks of the product. At this part of our Delta B3596LF Bathroom Faucets review, we need you to know that the weight is not an issue since you will not use it as a portable item. So, if you want a modern faucet that gives you performance and beauty, this particular product can be a nice addition to your bathroom.